Toon's Tunes : Five Finger Death Punched, and I didn't even try to block. Five Finger Death Punched, and I didn't even try to block. 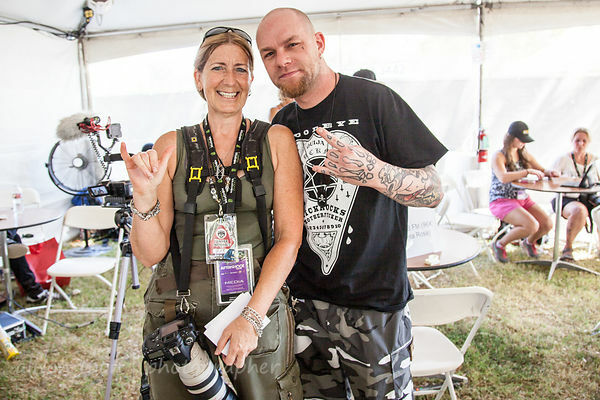 Sunday of Aftershock 2014, about 6.50 p.m. or just after, and all hell is breaking loose in the photo pit. Five Finger Death Punch is on stage, just starting their second song, and people are already flying over the barrier from the crowd into the pit between the barrier and the stage, and a huge, really huge, security guy with no security shirt but with an attitude that means business is telling we, very-crowded-in-the-pit photographers that we have to leave, now, RIGHT NOW! !, forget the three songs rule, we have to GET OUT, NOW; and then there's a sick or injured person blocking the exit, and we are scooted one way, then back the other way, still trying to grab that last photo, knowing that the security team are just trying to keep everyone safe but it's frustrating and just a little scary, too. It's a few minutes of madness down there, not incited by anyone on stage, though the audience has been well-and-enthusiastically primed by Pennywise and Rise Against and are just bursting out. The huge crowd, by this time, was an ocean of energy riding the waves of Ivan Moody's voice and Zoltan, Jason, Chris' and Jeremy's music. It was just spilling over. Darn wonderful show. All the songs everyone knows. Sing along and hope mother's not listening. (Oh, I was, s'OK, I sang along too.) "Lift Me Up", "Bad Company", "Burn MF..."... a beautiful version of "Remember Everything", Jason playing acoustic, Ivan singing, that's it... and then ending it all with "The Bleeding". Intense, heavy, melodic, angry, provocative, threatening. Did I say intense? But then rewind, back, go back three or four hours to just after two in the afternoon. Away from the crowd, in the relative-quiet of the media tent. Early, waiting patiently. I'd been set up for an interview with Five Finger Death Punch bassist Chris Kael, and while we did get to speak for a couple of minutes, the band's PR schedule had changed, and it didn't look like it would work out. So we hung on in the media tent watching, waiting, just-in-case one of the band would have a couple of minutes: observing Zoltan, articulate as always, being interviewed on video at the other side of the tent; big-guy Chris Kael cuddling a baby and having really-really cute photos taken; and then Ivan Moody, just coming over and sitting at our table like we were having a cup of tea on a Sunday afternoon!!! What a treat... I had my list of questions but as always, they flew out of the window. Or rather, tent flap. We talked international travel. Five Finger Death Punch are touring, what, nine months a year? International... Japan coming up soon. How do they manage with all the languages? I wanted to know... translators, interpreters, or muddling through like the rest of us? They just get by, Ivan said: he likes to have at least a few words or phrases ready, to make an effort, to try. Uncomfortable with the idea of not trying, wanting to reach out. Martial arts? The other guys, Zoltan and Chris, they're into martial arts. Ivan, he did boxing, golden gloves, that was more his thing. He's a gentleman. Truly... he is. It's hard to equate this humble, kind and sweet man with the hard-man singer; at least, not until you see that twinkle in his eye, the naughty schoolboy with a heart of gold and a bag full of old hurt. "I'll stick to bar fights", he said. Twinkle, twinkle. More photos from last night's Five Finger Death Punch show at Aftershock 2014 are here in the photo gallery. And for those of you who don't already know: Five Finger Death Punch have partnered with many military veterans's and PTSD (post-traumatic stress disorder) help organizations, to raise money and help. See http://www.5fdp4vets.com/ and do what you can to help. This is an international issue; no matter the reason someone decides to serve their country, whether it be patriotic or to earn an education or a trade or because their country is calling them, like after 9/11 in the USA, those young men and women serve us: they obey and they fight for their country, can suffer unthinkable pain and trauma, and deserve our help and support. No matter the war, no matter the fight.